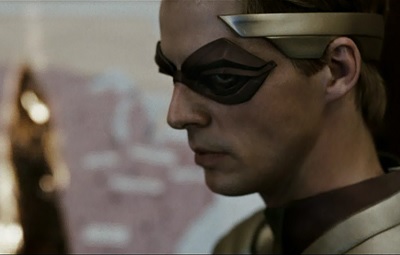 The Incredibles feels like someone dared Brad Bird to make a PG version of Watchmen. 1986’s Watchmen is quite possibly the most influential graphic novel of all time, so it’s no surprise that a film that both parodies and glorifies the superhero genre would draw heavily from it. Watchmen was turned into a film in 2009 with a few subtle changes, which I’ll discuss along the way. Since I’m primarily a film reviewer, I’ll focus on the film version of Watchmen as I compare it to the Pixar masterpiece The Incredibles. So watch closely as we examine how incredibly similar Watchmen and The Incredibles are. Superheroes are banned by government action after a series of abuses make them more trouble than they’re worth. The main story takes place after most superheroes have been retired for years. Some superheroes aren’t able to stop their fight against crime. Two superheroes save people from a burning building. In the course of fighting crime, some superheroes unwittingly find themselves in a showdown with the police. An unlikely pair of superheroes has kids together. The villain is killing former superheroes. Revenge for being humiliated is a big part of the villain’s motivation. The villain wants to trick the whole world with a well-orchestrated lie. A hero comically tries to find his uniform in order to participate in the last battle. The villain’s doomsday weapon is forged on a faraway island. The heroes watch the final step of the villain’s plan unfold on TV. The superheroes have to use their powers in public for the first time in years at the end. Now we’ll go into detail on each of these points. Superheroes are prevented from using their superpowers by a government edict. 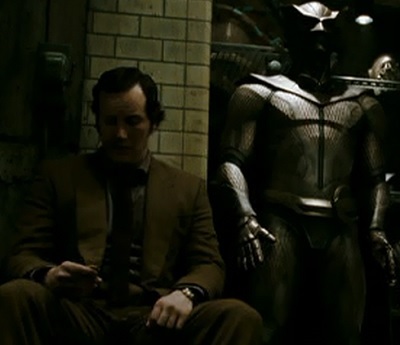 In Watchmen, the Keane Act is passed, effectively banning superheroes from engaging in vigilante activities without the sanction of the government. 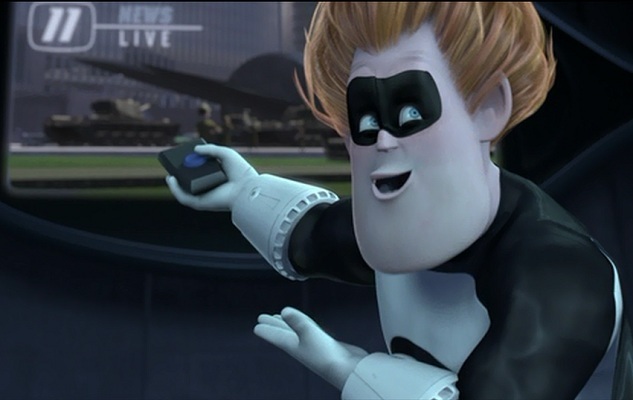 In The Incredibles, the government’s act isn’t given a name, but it has the same effect. All superheroes are required to stop fighting crime and are given new identities to facilitate their integration into society. Watchmen’s reason for outlawing superheroes is darker than the one in The Incredibles. In the former film, it’s because the public doesn’t trust superheroes and many of them have become too violent and even sadistic in their crime-fighting methods to go unnoticed. In the latter film, it’s because of all the collateral damage the superheroes incur in their efforts to save lives. Their cost-benefit ratio is all out of whack. The movie fast-forwards to several years after the main heroes’ prime crime-fighting days. Watchmen tells the story of a handful of former heroes who try to pick up the pieces of their lives in the face of tragedy. These heroes are Rorschach, Night Owl, Dr. Manhattan, and Silk Spectre. 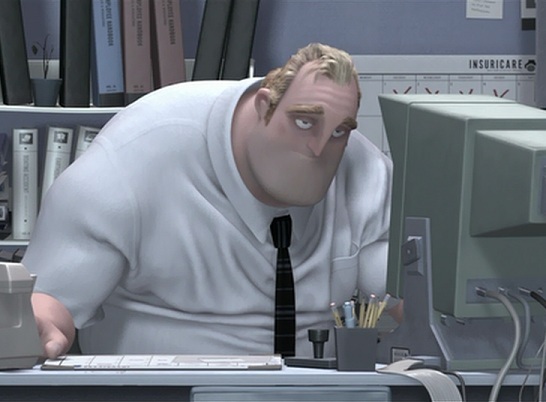 The Incredibles is mainly about Mr. Incredible’s struggle to fit into society as a middle-aged man when he yearns for adventure. This storytelling device is used to great effect in these films. It allows Watchmen to be grounded in the present while exploring the characters’ backstories. And it lets The Incredibles show Mr. Incredible’s inner turmoil as he remembers how great things used to be while also whetting the audience’s appetite for action. A few heroes carry on the thankless fight against injustice. Rorschach is the only one of the modern superheroes who continues to fight crime without the sanction of the government. He mostly investigates murders at night and visits his old friend Night Owl, who secretly wishes to join him. Mr. Incredible and his friend Frozone pretend to go bowling once a week as an excuse to get away from their families and engage in vigilantism. 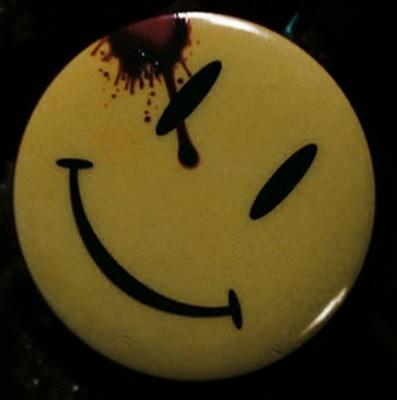 Watchmen presents the need to be a crime fighter as an obsession or even a fetish. The Incredibles treats it more as a desire to escape from the tedium of everyday life and as a way to relive the glory days. A superhero duo saves people from a burning building. Night Owl and Silk Spectre eventually team up and decide to save a large group of people by airlifting them off the roof of a burning apartment building moments before an explosion destroys what’s left of the building. Mr. Incredible and Frozone save several people from a burning building by crashing through a wall just as the building collapses. This is the first really heroic thing we see the aging heroes do in these films. 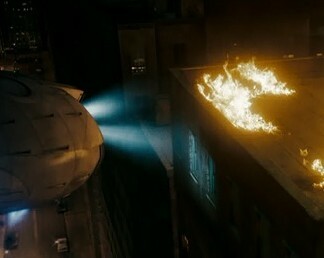 In Watchmen, most of the action sequences up to this point involve self-defense or attempted murder. In The Incredibles, it serves as a nice callback to the spectacular opening scene and it’s a nice release from Mr. Incredible’s boring life. Some heroes are cornered by the police while trying to do their job. In the course of Rorschach’s investigation, he is led into a trap and surrounded by SWAT teams. He does an impressive job improvising an escape, but his efforts fall short in the end, and he is taken into custody. Mr. Incredible and Frozone unwittingly break into a jewelry store while escaping the burning building. The police quickly arrive and assume they are jewelry thieves. 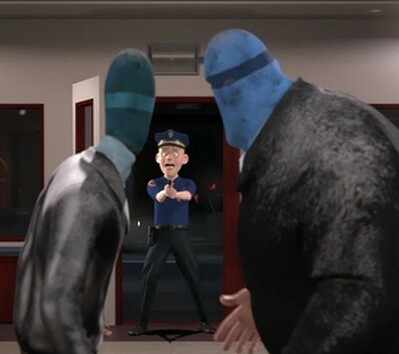 But thanks to some quick thinking, Frozone subdues the officers and he and Mr. Incredible beat a hasty retreat. The endings of these two scenes are polar opposites, again contrasting the grittiness of Watchmen with The Incredibles’ more sanitized take on the material. Two superheroes, who seem to have nothing in common, wind up having children together. The Comedian plays an important role in every part of the superhero era. As a young man he assaults the first Silk Spectre and does many other things to prove what a morally reprehensible man he is. But it is later revealed that he and the Silk Spectre somehow put their differences aside and conceived a girl who grew up to become the second Silk Spectre. Mr. Incredible and Elastigirl have different goals and ways of achieving them, but they have enough chemistry to fall in love and raise a whole family of superheroes. The revelation that Silk Spectre II is the daughter of the Comedian is one of the biggest surprises in Watchmen. It simultaneously devastates her and restores Dr. Manhattan’s faith in humanity because such an incongruous union seemed utterly impossible and yet it produced a wonderful person. A big part of the villain’s plan involves killing off former superheroes. Ozymandias is a former superhero who publicly revealed his identity before the Keane Act and proceeded to earn a fortune from his popularity. He is a genius who sets up an elaborate plan that relies on misdirection. He kills the Comedian to prevent him from revealing his secret plan. He then fakes his own attempted murder and neutralizes Rorschach and Dr. Manhattan. Syndrome is a spoiled brat who is also quite intelligent. He, too, has an elaborate plan that involves killing off every former superhero as a means of ridding the world of any opposition and making his ultimate weapon stronger in the process. The superheroes are killed off for different reasons, but the result is the same: fewer costumed heroes to try to stop the villain. The villain takes revenge on an aging superhero for mocking him years ago. In a slight deviation from the graphic novel, the film Watchmen shows Ozymandias (not Captain Metropolis) trying to get all the modern superheroes together for one last hurrah to save the world from destroying itself. But that idea literally goes down in flames when the Comedian interrupts the meeting. Ozymandias probably found it both ironic and satisfying to kill the Comedian as an act of revenge for that humiliation and to make sure his original plan to save the world would come to fruition. Mr. Incredible thought a fanboy was a nuisance years ago, and he did everything he could to dissuade the boy from following him and putting himself in harm’s way. But the boy became bitter and interpreted Mr. Incredible’s actions as rudeness and bravado. So he dedicated his life to amassing wealth and inventing new technologies to enable him to become powerful enough to defeat his former idol. Thus, he became the villain known as Syndrome. The villain of each film comes as a big surprise. Both have serious psychological problems and hero-worship issues that they are unable to cope with. The villain wants to make everyone in the world believe a lie. To prevent World War III, Ozymandias comes up with a plan to unite every nation against a common enemy. In the graphic novel, it’s a manmade alien being, but in the film it’s Dr. Manhattan. Ozymandias decimates New York City in what appears to be the first strike of an enormous war with Dr. Manhattan. The ends justify the horrific means, in his mind. Syndrome’s plan is much less complex. He wants to make everyone think he has superpowers thanks to his high-tech gadgets and by taking out a threat that he created. However, his plan backfires and he has to be rescued by the very superheroes he was trying to kill. Ozymandias seems to be more successful than Syndrome, but his plan could easily backfire. The ending suggests that Rorschach’s investigation could blow the lid off the whole conspiracy. A superhero has to hunt for his uniform before joining the final fight. This is just a silly little thing, but it’s still worth noting that Rorschach and Frozone share a similar comical scene in which they have to convince someone to show them where their uniform is. Rorschach demands it from his ineffectual psychologist before breaking out of jail, and Frozone tries everything he can think of to wrest it from his longsuffering wife. 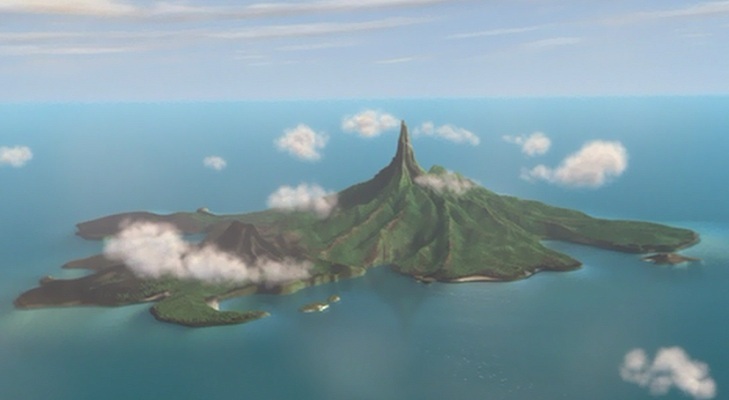 The villain’s operations take place on an isolated island. Ozymandias’ base is located in Antarctica. In the graphic novel, he also has a collection of artists, special-effects experts, and brilliant scientists working on an island for a long time to come up with the design for the “alien.” Syndrome has a hidden base underneath a tropical island. He even uses the volcano as a launch pad. The villains have good reasons to keep their operations secret in places where the authorities wouldn’t be able to find them. They consider all of their people expendable, too. The villain forces the heroes to watch his plan come to fruition on live television. Ozymandias shows the superheroes who are trying to thwart his plan the news reports of what he has done in order to convince them that fighting him is pointless. Syndrome shows the captured Incredible family live news reports to gloat. I find it interesting that both Ozymandias and Syndrome want an audience for their victories. Ozymandias has already triumphed at that point while Syndrome is premature in his celebration. This reveals their maturity level. Syndrome is still a whining child while Ozymandias is a self-styled Alexander the Great. The superheroes don’t have time for subtlety as they desperately try to save the day. When Rorschach and Night Owl try to unravel the mystery at the end, they don’t even try to disguise what they are doing. They just walk into a bar and violently obtain the information they need. The Incredible family also resorts to violence to defeat Syndrome’s ultimate weapon. They use all their powers in full view of the public to finally bring the destructive machine down. The world might not be ready to welcome superheroes back with open arms in the end, but it looks like they’re not going anywhere. The difference is that they will strive to be more discreet than they were in the old days. Watchmen and The Incredibles are cut from the same cloth. They follow similar stories and they both offer significant departures from traditional superhero stories. Is The Incredibles an awesome take on the already-amazing story of Watchmen? I’ll whisper: yes! This entry was posted in Movie Matchups and tagged action movies, comic books, films, incredibles, movie review, movies, parody, pixar, relationships, science fiction, watchmen. Bookmark the permalink. I really enjoyed this article. I love Watchmen and it has been many years since I have seen The Incredibles. In fact, when I saw The Incredibles I had never even heard of Watchmen, which is probably why the similarities eluded me. I will have to watch it again through this new prism. Missed the thing about capes. Dollar bill is killed after his cape get stuck in a revolving door and is shot. Good call. That’s a great connection. Thank you.